I can’t describe how delicious it was. I even didn’t know that this citrus-pasta union existed, or that it could be at once so filling and refreshing, the perfect compliment for this great, yet grueling day. I’ve had cravings for the dish ever since. My solution was simple and a little scary: I’d get a feel for recipes, and try to make something myself. After nosing around, I found a promising starter recipe at Lucillian Delights. My original plan was to document my process food-blog-style. Unfortunately I was working out of an underground communal kitchen, which–Kim and Rebecca can back me up on this–gets less natural sunlight than a solitary confinement cell, and limits that appetizing, foodie-friendly glow. 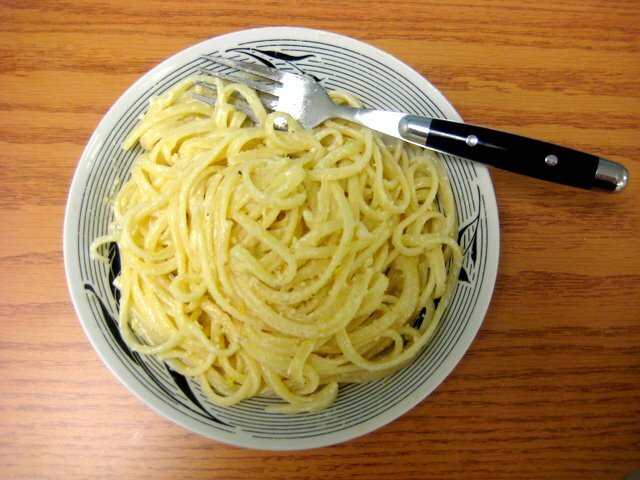 I cooked a portion of spaghetti in one pot while reducing a lemony cream sauce in another (see the recipe below for better details). Thyme and rosemary kept the aroma delicious instead of dish-soapy. Before too long both components were finished and I had a familiar, long-awaited plate. I snapped a photo and immediately dug in. Simple recipes like this one depend on the quality of their ingredients, and in an ideal world I would have invested in North End parmesan to grate on top, but the experiment was still a success. It’s not something I’d make every day, since I’d like to save both the novelty and my arteries, but I was glad to learn that no less delicious on a wintry Boston afternoon than it was in the Roman shade.